Even the name was deceptive as "amogable" makes me think of "amigable" or amiable, friendly. I'm convinced that last time I checked, it was a only small detour on the way to Asturias, where we spent Semana Santa or the Catholic version of Easter, but it turned out to be anything but the case, and added a couple of hours on to the already long trip up north. At the last moment my wife suggested I went there and back on my own, and then we went as a family to Asturias from Madrid, but I managed to convince her to drive me all the way there and spend 5 hours waiting for me, all the while looking after the two kids and a dog (on heat). I'm a lucky man. Triathlons and duathlons are always a bit of a logistical headache but I knew better than to complain about it. In fact, I was more relaxed than I usually am when we go to Asturias; normally, I am agitating about leaving the house - for example, standing near the door with my coat on - while everyone else is doing last minute preparations. Apart from not testing the patience of my wife, it was important not to waste precious mental energy on the journey: I would need it for later. It was all very low cost but there was a good atmosphere and people (organizers and competitors alike) were very friendly and helpful. I had remembered to pack toilet paper - which was just as well because there wasn't any available in a radius of at least 10 kilometers - but I had forgotten to take sun screen. In spite of being at 1,000 m altitude in March, it was very hot and the sun was beating down relentlessly. Once I had done all the requisite fiddling with my bike and other equipment, I tried to find Dani who I knew had brought sun screen (it's funny now to think that we used to call it "sun tan lotion"). It shouldn't have been difficult to spot his 6'5" frame among the other 200 or so athletes but unfortunately I didn't find him in time before we were lining up at the start. (Although, inexplicably for such an out of the way location, the start was delayed by at least 10 minutes, more than enough time to splash on some protection.) I left my bike on the rack but had to figure out an ingenious way of stopping it from flapping about in the wind, with the disc wheel acting like a sail. As I have one of those sawn-off saddles (Adamo), it probably would have fallen off the rack otherwise. The fist leg of the duathlon was a 12 km run (actually, it was more than 13 km, but hey). The route was an out-and-back loop along a sandy path which we had to complete 4 times. Not the most inspiring course but the surroundings were quite pleasant and at least this way you got to see how you were doing compared to the others. The leader was way out ahead, running with a smile on his face and apparently not even having to breathe. Just before we set off, Chema had asked me at what pace I was thinking of running and, for some reason, I said 3:45 /km - which, I suppose, is the pace I had done some of my brick (bike-run) sessions at, and corresponds, more or less, to my Half Marathon pace. Ivan sensibly pointed out that it would probably be prudent to take account of the heat, so I figured I would go off at around 4:00 /km. It proved to be harder work than I had expected - maybe the altitude also had something to do with it - so I let myself slow down a bit as the run wore on. After all, there were still more than 2 hours effort ahead of me. Finally, the moment I had been waiting for: a chance to try out my superbike on a flat course with no-drafting! If only there were pure time-trial bike races available in Spain to us amateurs - but no, the federation in control of this sport only organizes time-trial races for professional teams. I have often wondered why someone doesn't just organize a cheeky duatlon consisting of a 1K run + 100K no drafting bike leg. Anyway, I set off and soon discovered that this was not going to be a piece of cake by any standards. I distinctly remember thinking my Garmin was off because I couldn't be going that slowly, surely. But it was quite windy on the way out and not as flat as one might hope. That, coupled with two 180 degree turns per lap (of which there were 3, making a total of 61 kms), meant that the course was far from ideal. The turning circle on my bike is so wide that I found it better to unclip one of my shoes and do a kind of pirouette, but this meant that I lost a lot of speed on the following descent trying to clip my shoe back in without risking falling off the bike (if you try to clip in with the pedal upside down there is a good chance your foot will slip off completely and you will end up leaving a streak of skin on the road). It was slightly hair-raising to be belting along those narrow roads with people coming in the opposite direction, especially when several people were overtaking on both sides of the road at the same time. Then, of course, there were the cows which would occasionally decide that the grass was greener on the other side of the road. The real problem, though, was that I started to get the dreaded cramps after only about 10 km. They didn't bother me too much on the bike as long as I adjusted my pedal stroke or stood up now and again, but they were a warning of what was to come. I tried to put them out of my mind and pretend that they would go away. 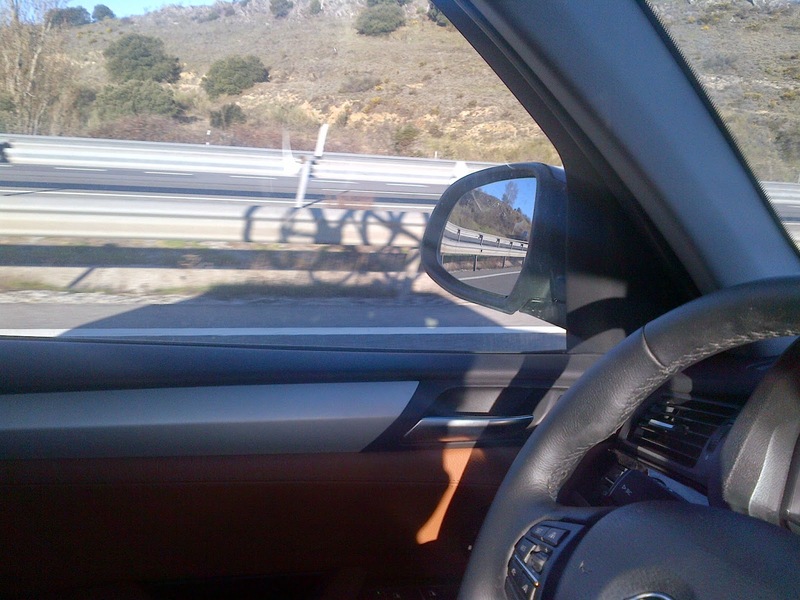 All in all, I enjoyed the bike ride and seemed to get faster as my confidence grew. I was disappointed with my time - my average speed was slower than my bike leg of the Ironman in Brazil, and that was on a "normal" road bike. I still haven't managed to prove to myself that my superbike is any faster and I am left with the nagging doubt that, although it is clearly more aerodynamic - something that I did notice on certain flat and windy stretches compared to others riding on road bikes - maybe I am losing too much power from the tight angle between my hips and my torso. Who knows. All I know is that I don't want to go down that road of obsessing over bike fitting etc: at least my bike looks cool. The good news is that I found the aero position reasonably comfortable in spite of it being so aggressive. The cramps seemed to ease up a little bit in the final straight of the final lap. Somehow I managed to do the second slowest transition out of everybody so maybe I did something wrong, although I'm pretty sure that you had to basically loop all the way around the bike racks. As mine was parked close to the start of the run, I think this maximized the amount of running I had to do while wearing cycling shoes, so maybe this was the reason. 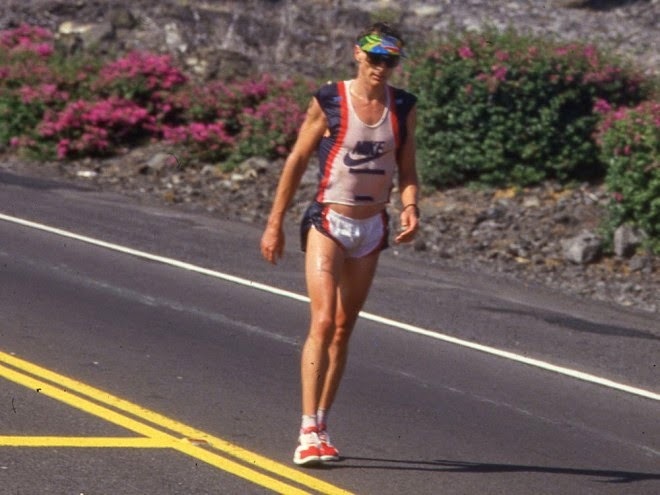 This was the image that came to mind 100 m into the 6.5 km run: that of Mike Allen in the Ironman World Championships in Hawaii, when he got passed by Dave Scott. My legs completely seized up to the point that I was actually rooted to the spot. I couldn't bend my legs at all and I couldn't move either without risking all kinds of muscular havoc. One generous athlete offered to help me stretch but I refused the offer because I wasn't sure quite how we would go about it. Eventually I managed to crouch down and then lie down. At this point someone asked if they should call the Red Cross but I said I was only 100 m from the finish line (well, start line really) and I was fairly sure I could at least make it back that far. I began to understand why the loops of the running course were so short. Some time passed and my legs began to ease up, so I started off at an easy pace. This is the sort of pace at which it is actually more tiring to run any more slowly. Of course, the cramps soon came back and I had to repeat the whole charade. I saw Ivan looking a little stressed but he'd evidently started the run before me - something that I found slightly depressing because I wasn't just paying in cramps for overcooking the bike leg: the bike leg hadn't been so great either. Then I saw Chema looking breezy and he gave me some encouragement as he swept past. I tagged on for a bit but then started to find myself getting short of breath and feeling nauseous. Maybe it was those gels which I greedily gulped down as I racked my bike or maybe it was the altitude. Or maybe I should have done not only "BRicks" in training but "RuBRics" - Run-Bike-Run sessions. In the end, this feeling of drowning in air became more of a stopper than the cramps but I soldiered on and - in spite of stopping a last time some 50 m before the finish line in full view of my expectant family - I "ran" with my eldest son across the line in a time of around 3 and a half hours. My wife was understandably impatient to get moving but, another of those hassley things about triathlons / duathlons that I'd forgotten about, is that you can't get your bike until the last person has finished the bike leg. While I was waiting around, I found myself standing next to the winner, who looked a bit like an albino version of Mo Farah. As I have often found to be the case with people in a class of their own, he was very natural and asked how I'd done, noting elegantly that "everyone does what they can". Epilogue: I felt very nauseous in the car and looked quite pale with sunken eyes. It's hard to make sure you drink enough and this is especially the case in the aero position on the tri-bike. As usually happens whenever I have suffered from the dreaded cramps, it took several days before I could walk again normally, let alone run. Probably not an experience I will rush to repeat but a worthwhile one, nonetheless. 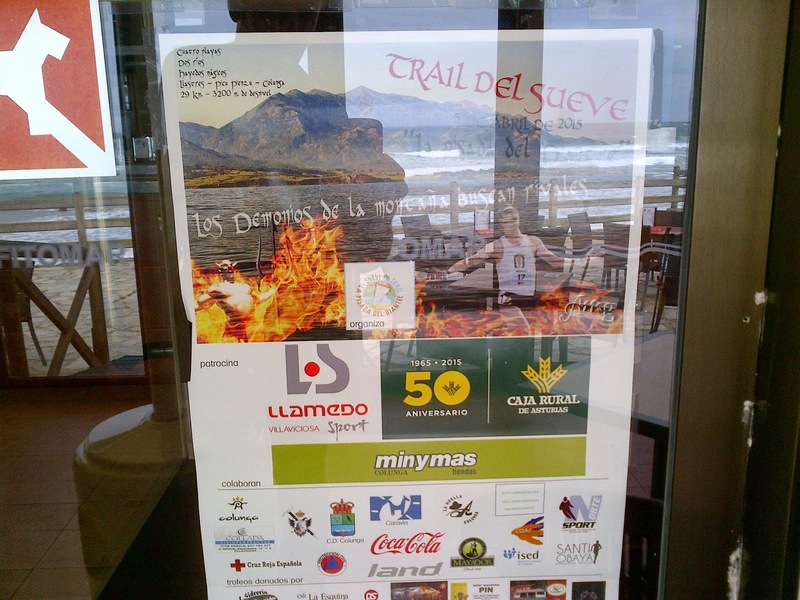 In spite of this, when I spotted the following publicity for a 30 km race (with 3,000 m climbing) that just happened to be taking place the coming weekend near to our place in Asturias, I was very tempted to enter without any specific preparation whatsoever. It was just as well that my family talked me out of it (my son said "Daddy, don't you think you should recover from the last one before you think of doing another?"). Apart from the winner taking about 3 hours to complete giving an indication of the difficulty, this YouTube video shows just how technical some parts of it are. Having said that I am very tempted to enter next year. What we did do, though, was a flight with a paraglider in Gijón (Asturias) - this was my Father's day present. It was absolutely awesome, even if I did land face down in a muddy puddle with 90 kgs of pilot on top of me. If I find the time, I'll upload the video to YouTube.